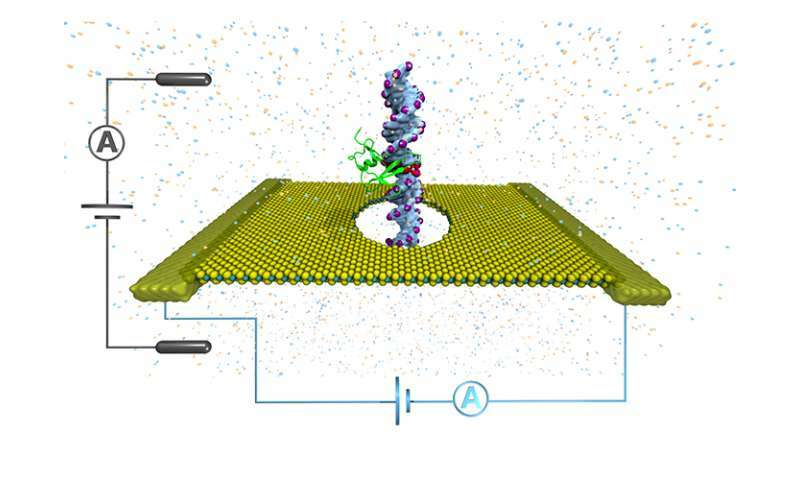 The method threads DNA strands through a tiny hole, called a nanopore, in an atomically thin sheet of material with an electrical current running through it. The study was published in the inaugural issue of the journal npj 2D Materials and Applications, a new journal from Nature Press. "One or a few methylations is not a big deal, but if there are many of them and they are packed close together, then it's bad," said study leader Jean-Pierre Leburton, a professor of electrical and computer engineering at Illinois. "DNA methylation is actually a starting process for cancer. So we want to detect how many of them there are and how close together they are. That can tell us at which stage the cancer is." Other attempts at using nanopores to detect methylation have been limited in resolution. Researchers begin by punching a tiny hole in a flat sheet of material only one atom or molecule thick. The pore is submerged in a salt solution and an electrical current is applied to drive the DNA molecule through the pore. Dips in the current alert researchers that a methyl group is passing through. However, when two or three are close together, the pore interprets it as one signal, Leburton said. The Illinois group tried a slightly different approach. They applied a current directly to the conductive sheet surrounding the pore. Working with Klaus Schulten, a professor of physics at Illinois, Leburton's group at Illinois' Beckman Institute for Advanced Science and Technology used advanced computer simulations to test applying current to different flat materials, such as graphene and molybdenum disulfide, as methylated DNA was threaded through. "Our simulations indicate that measuring the current through the membrane instead of just the solution around it is much more precise," Leburton said. "If you have two methylations close together, even only 10 base pairs away, you continue to see two dips and no overlapping. We also can map where they are on the strand, so we can see how many there are and where they are." Leburton's group is working with collaborators to improve DNA threading, to cut down on noise in the electrical signal and to perform experiments to verify their simulations.